This was a good purchase after trying all the competition. Why the 2011 BMW X5? Diesel is outstanding once you understand the "nuances" such as some turbo lag and different sound. It is very quiet at highway speeds and pulls my 4000lbs. boat and trailer with ease. Mileage is good (19 city, up to 27 highway) with about a 25% reduction while towing. Handling is superb. Much better than my ML. The steering is typical German, very tight, a little heavy, with great centering and feel. Get the Sport Package. Be aware that the run flats are a little rough and the ride is very stiff, although the diesel is better than the gas version. Free service for the life of the warranty is great, but be aware that the urea will only be filled at service interval. Run low before that time and you might pay (although my dealer did not charge me). Nav is a little tough to work with at first, but the huge display helps. Sound system is ok, but the upgraded system is a must. Standard system is awful. Sirius is a awesome. Sport seats fit well. They have an adjustable, power bottom cushion extension. Well worth the extra money and the seat heaters are very good. Much better than my ML. Very good visibility with large mirrors, but rear quarter is a little blind. Great steering wheel and heat, but again, get the sport package. 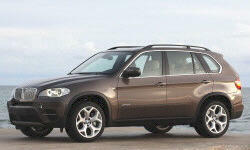 Why Not the 2011 BMW X5? Ride is rough over bad pavement, but part of that is the run flats. Diesel rides better than gas, particularly the sport package. I had an issue with a popping noise in the A/B pillar area. Dealer needed a couple of weeks to find out that there was some "oil canning" where two sheets of metal met and flexed. Now that this is fixed, the truck runs very quietly, but don not this this is a Lexus sedan. The diesel sound is not for everyone, but I like it. This is not a tall vehicle. Do not expect to fill this as you would a Tahoe. Seats almost fold flat. 5000lbs towing is ok, but not as good as Mercedes or Porsche. The towing package is a dealer installed option and costs about $1200 total, includeing a software reprogram that can be time consuming. Mine took a full week (although I was given a great 535i loaner).